Born in 1949, Carol Velarde is one of our miniature experts. She is the daughter of Teresa Gutierrez, and her sisters are potters Marie Suazo and Doris Tenorio. They are known for their black carved ware – very traditional in use of materials, style and technique. 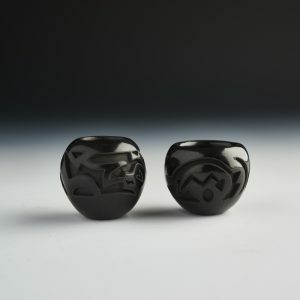 The family specializes in precisely carved black pottery, often outlining the carved edges with a matte paint finish.